We couldn’t be more wrong. 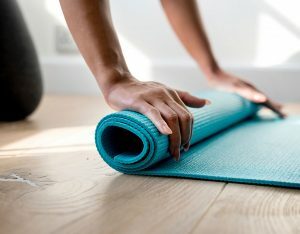 In fact, Matwork Pilates can be just as challenging (if not more) as the equipment versions and should not be overlooked in our weekly exercise regime. Here are five great reasons why you should pencil in a Pilates Mat workout 1-2 times per week. When we only have our body to focus on, it’s the perfect time for us to check in with our technique and make sure we aren’t skipping out on the fundamentals i.e. correct “core” activation, correct spinal positions and breathing patterns. Mastering consistent and regulated inhalation and exhalation facilitates optimal body functions, physical changes, cleanses the body, increases strengthen, rejuvenates and invigorates (Geweniger & Bohlander, 2014). Remember, what we learn from our Matwork class will always assist us during other classes. During Matwork pilates, we don’t have to worry about changing springs, straps and other supportive equipment, we can flow from one exercise to the next much faster and with ease on the mat. This can also increase cardiovascular endurance. Tick! Muscles work in both concentric (shortening) and eccentric (lengthening) phases to stabilise a joint (Behnke, 2006). During Matwork Pilates exercises we focus on both components of muscle activation to gain increased joint and core stability. The challenge in Matwork, instead of relying on the assistance and support of a machine and its springs, is we are in full control of our own body and therefore must work harder to resist against gravity during each movement. Muscle activation is the most important aspect of Pilates. Matwork Pilates allows a better understanding of activation and control of particular muscle/s, building newer and faster mind to muscle connections. You can expect to see an improvement in the quality and control of your exercises plus feeling that burn in the right places at the right time. Keep your body guessing, see you on the mat! Geweniger, V., & Bohlander, A. (2014). The Pilates Concept. In Pilates? A Teachers’ Manual (pp. 11-16). Springer Berlin Heidelberg. Behnke, R.S. (2006). Kinetic Anatomy 2nd ed (p 45). United States of America: Human Kinetics.